Mitt Romney says he is following the “precedent” set by John McCain in releasing just two years of tax returns. That’s accurate. But McCain, the 2008 GOP nominee, bucked the trend of other recent presidential candidates. 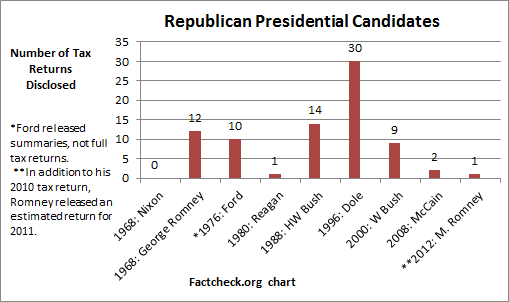 In more than three decades, no other nominees for either party have released fewer than five years’ worth of returns. Romney’s own father released a dozen years’ worth when he ran for the GOP nomination in 1968. Romney has been under mounting public pressure to release tax returns — largely due to the Obama campaign raising questions about Swiss bank accounts and investments in the Cayman Islands, a tax haven. Romney has released his tax returns for 2010 and an estimate for 2011 (the full return of which he says he will release later). He says that’s enough. Asked whether he would release additional tax returns, Romney said in a series of interviews with Pittsburgh news stations on July 17 that he had no interest in providing additional fodder for Obama campaign opposition researchers to pick over and distort. Romney said he would stick to the “precedent” set by Sen. McCain, who released two years of tax returns in the 2008 presidential race. Romney on WTAE, ABC, July 17: I’m releasing two years, just as John McCain released two years. Romney on KDKA, CBS, July 18: Well, we’re releasing two years of tax returns, and there are hundreds of pages of documents in those two years. And John McCain also released two years of tax returns. … We’ve seen the precedent of John McCain. We’re following that precedent. Romney on WPXI, NBC, July 18: I’m releasing two years of returns. It’s the same as John McCain, and that’s a precedent I’m following. It’s true that in the 2008 election, Republican nominee McCain released just two years of tax returns. But you have to go back more than 30 years — to President Ronald Reagan, who released one year’s return in 1980 — to get to a major party nominee who released less than five years of tax returns. Over those three decades, the number of years of released tax returns went from a high of 30 by Republican Bob Dole in 1996 to a low of five by Democrat Michael Dukakis in 1988. In 1968, when Romney’s father, George Romney, released 12 years of tax returns — saying, “one year could be a fluke” — his Republican primary opponent Richard Nixon didn’t release any tax returns. Nor did Democrat Hubert Humphrey. In 2008, for example, he said, Barack Obama released seven years of tax returns to pressure then-Democratic primary opponent Hillary Clinton to follow suit. The clamor is always louder for wealthy candidates, Thorndike said. And Romney, he said, “is one of the richest candidates we have had in a long time.” The Romney campaign puts Romney’s worth somewhere between $190 million and $250 million (financial disclosure forms put it in the broad range between $85 million and $264 million). Heinz, the widow of John Heinz, heir to the ketchup fortune, eventually released a summary of her 2003 taxes. But unlike the Romneys, Kerry and his independently wealthy wife filed separate tax returns. So Kerry was not legally responsible for what she paid or didn’t pay. John McCain’s wife, Cindy, did the same as Teresa Heinz, releasing a summary of her 2006 returns during the 2008 campaign. We should note that although the Romneys file jointly, the Romneys also released the 2010 returns for individual trusts, as well as for a family trust and a charitable foundation. CBS News and CNN both did thorough analyses of the history of tax returns released by presidential candidates and their spouses, and the Tax History Project has a detailed database with links to presidential tax returns. Again, Romney isn’t wrong about McCain releasing just two years of returns. And Romney may decide to stick to that “precedent.” But his comments imply that the two years released by McCain is standard, and that he has been unfairly asked to release more than others have in the past. 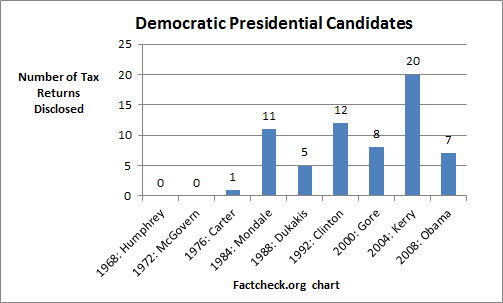 In fact, with the lone exception of McCain, all candidates over the last 30 years each have released more than two years of tax returns.